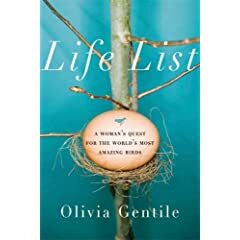 Olivia Gentile’s Life List is the book I gave this Christmas. My mom and my mother-in-law both got copies. I loved this book. I think about it all the time. I am a little amazed to find that it’s not a bigger phenomenon than it is. Life List, the biography of legendary birder Phoebe Snetsinger was one of my favorite reads of fall 2009, but I had to special order it from Three Lives where they hadn’t heard of it. Though stumping the geniuses at Three Lives brings me a small swell of pride, I was baffled. How could you not want to read a book about a 50s housewife who turned a terminal cancer diagnosis into the inspiration to pursue her hobby of birdwatching with ever greater seriousness? And how not love the irony of her so far outliving her diagnosis that she eventually had the longest life list of anyone on Earth. Last year, when a friend sent me the information with a link to her friend’s (very fun, beautiful) website with tons of lovely drawings by Rebecca Layton, I was excited and filed the book away in memory. I happened to catch Leonard Lopate’s interview with Gentile on WNYC and my interest only grew. Snetsinger’s story is a super-interesting manifestation of the Betty Friedan problem: she had always wanted to be a scientist but lacked the courage to defy social expectations; she married, had four children, and grew increasingly depressed and distanced from her marriage and life. The difference for her—the escape—was the combination of a terminal diagnosis and the financial security that came from having a successful husband and a small legacy from her father, advertising legend (Marlboro Man, Jolly Green Giant) Leo Burnett. Gentile’s book is well written, mostly journalistic, but with a kind and humane voice and a strong feminist subtext—especially helpful in asking us to piece together and imagine some of Snetsinger’s choices and a real page-turner. In addition to being a really rich footnote on the plight of the dissatisfied housewife, Life List is also full of amazing story after story about exotic, dangerous, and uncomfortable birdwatching expeditions. I love the preface, in which Gentile goes on a bird walk as a disinterested beginner and the leader says “Who knows? You may be the next Phoebe Snetsinger!” That confident enthusiasm and the unusual name combine to make the germ of this wonderful book.